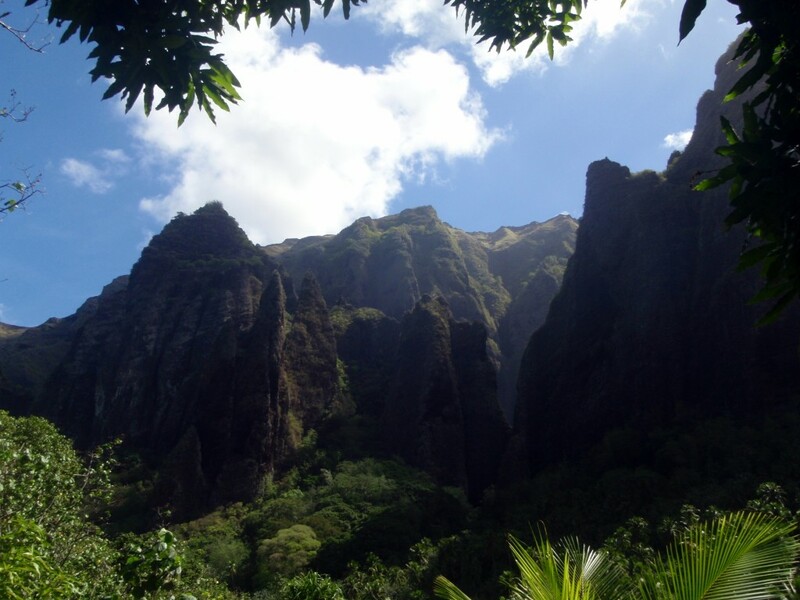 When I say that I’m in the Marquesas, most people have no clue where it is. I actually think that very few people would be able to find these islands on a map unless they knew precisely where to look. When I say they are in the South Pacific, part of French Polynesia, people picture white beaches, coral reefs and palm trees. Few picture what they really look like: Lush towering volcanic islands with dramatic cliffs, incredible nature and very friendly locals. With freshly trimmed beards, we opened the hatch to the beer storage and dug in. The captain had ensured that a few beers had been put in the freezer, so we had a few cold ones ready for the party. A few other boats were happy to join the fun. After 3 weeks at sea without a drop of alcohol, we more than made up for that in the 5 days at Fatu Hiva. We also enjoyed a nice pig roast together with the rest of the anchorage, trekked to the top of a nearby mountain, hiked to a waterfall, went free-diving, traded with locals and did basically everything we could to relax. 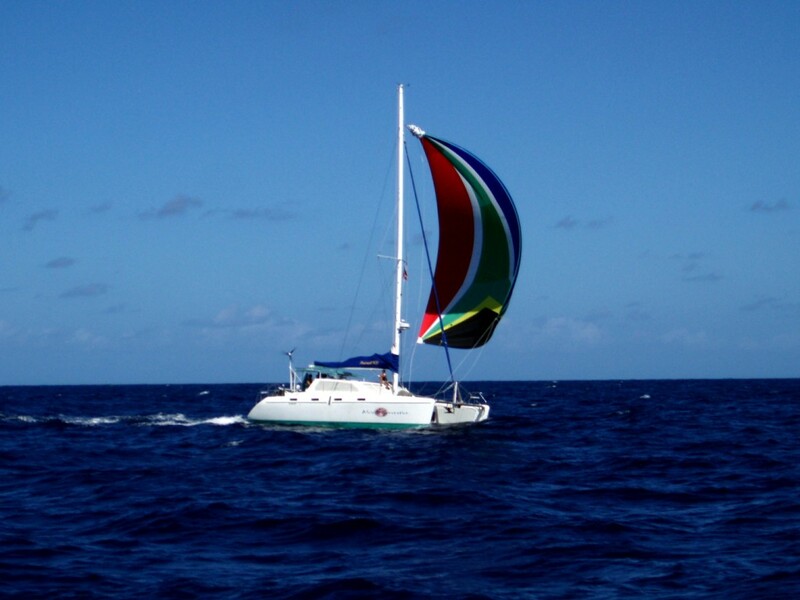 When we hoisted anchor and sailed for Hiva Oa to check in, we did so together with 5 other boats. We had agreed not to race, but as soon as we woke up we knew it was a race, because everyone had left before us. We hoisted anchor in a hurry and set off after them. All the other boats got great shots of us as we passed them, which was nice, because I didn’t have any good pictures of AI under sail. It was also good to see that despite being heavy, we were still faster than the other cruising boats. In Atuona (the biggest village on Hiva Oa) we checked in and were given our allotted 3 months in French Polynesia. Hiva Oa was also the first place we were introduced to Polynesian prices (On Fatu Hiva, we bartered for everything, because they didn’t have a bank or ATM on the island). Let us just say that things seem cheap in Norway compared to Hiva Oa. Paradise comes with a price and we’re happy to pay it. 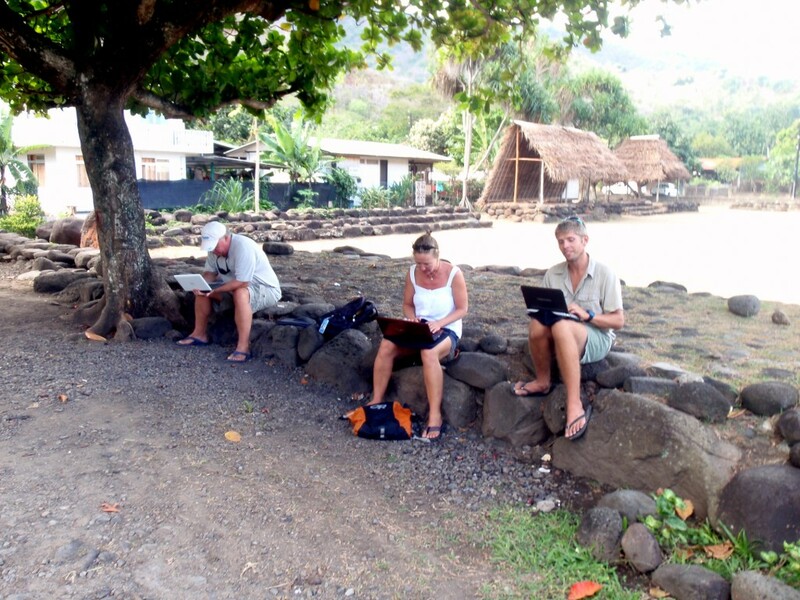 We spent 2 nights in Atuona resupplying and doing some Internetting. I found a free wi-fi connection, but to use it, you had to sit in the drive-way to an art center. Obviously free wi-fi was worth it. 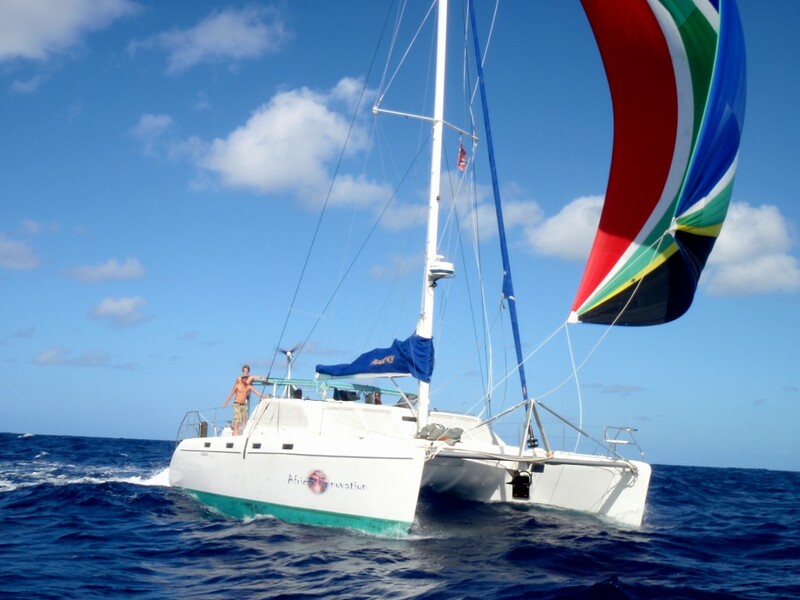 When we hoisted anchor, we sailed to Hanamenu, North West on Hiva Oa, together with Liquid Courage, Nikita and Savannah. On our first day there, I went on a little hike to survey the surrounding mountains. While climbing a particularly steep part, I came across one of the burial spots for local chiefs. I chanced a quick picture, before I hurried on. It was a bit of a shock, because only minutes earlier I had set up a picture with a ram skull, so coming across real human bones was a bit of a surprise. The highlight of the stay in Hanamenu was without a question our beach BBQ. It started before sunset and lasted until well after sunrise. All of us slept on the beach and we made it a proper night out. After having a proper hang-over day, we set sail the following evening for Daniel’s Bay on Nuku Hiva. As usual “the race that wasn’t a race” was fierce and brutal and we scraped a win, pulling in 10 minutes before Liquid Courage. 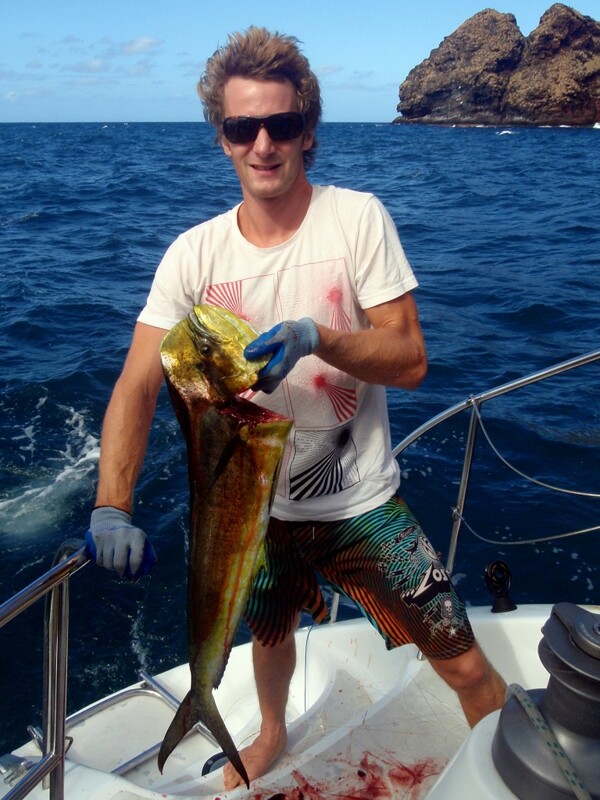 As an added bonus we caught a decent Mahi Mahi, just as we were dropping the gennaker and pulling into Daniel’s Bay. Daniel’s Bay is the perfect place to chill out and relax. 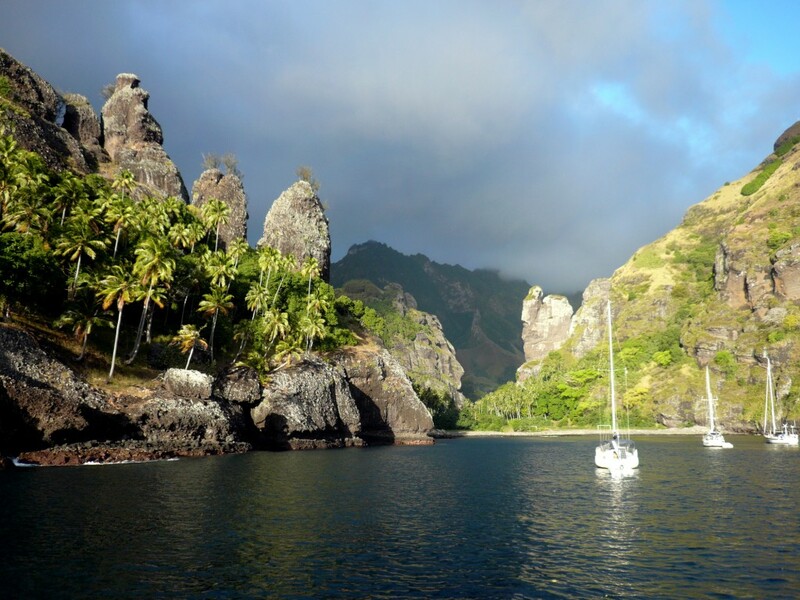 It is probably the best protected anchorage in the Marquesas, so if the wind and waves pick up, that’s a perfect spot to be. 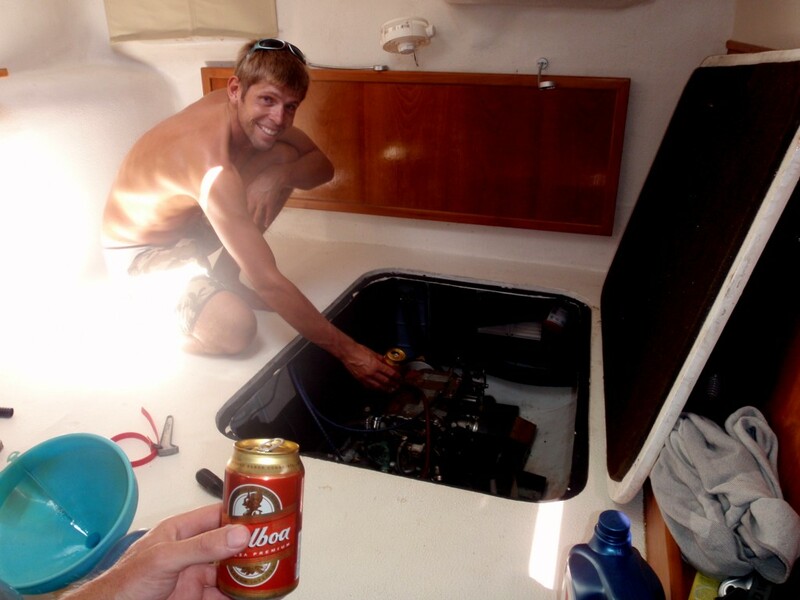 We shared the bay with 5 other boats and used the first day to do a couple of boat projects, where I decided that sharing beer with the engine might make him more cooperative. On the second day to go on an excellent hike to a beautiful waterfall. The evenings were spent doing proper bonfire BBQs. The most memorable one was hosted by two local hunters. They shot a wild pig that they roasted for us. We ended up spending 4 days in Daniel’s Bay, before we motored 4 nm to get to the biggest village in the Marquesas: Taiohae. We hadn’t even dropped anchor before we were invited onboard La Familia, the first Norwegian Boat we’ve seen since Galapagos, for a birthday celebration. The birthday girl was turning one, but it didn’t stop the adults from partying, well, like adults. The party started on La Familia, moved to Haze and ended up on AI. At least I think it did, because I passed out in my dinghy while the party was raging on Haze. We befriended another American Boat named Broken Compass, captained by Brett and Chad (identical twins) with a huskie puppy named Makai as their trusted companion. They brought me fishing in their dinghy and gave me some hot tips on how we might be able to win the fishing competition we have with Quartermoon, Fine Gold and Walloomoolloo. In Taiohae I was also given my prize dinner for winning the African Innovation Trivia Challenge. We went to a great (and the only open) restaurant, where I enjoyed a sensational Fillet Mignon. We are now in the process of resupplying and getting ready for the sensational atolls of the Tuamotos. They are what people think about when you say South Pacific: secluded, uninhabited atolls, with amazing fishing, diving and surfing. We are incredibly ready and will probably shoot off tomorrow, after we have topped up our water tanks. Sounds like you’re having a blast, passing out in the dinghy and all! To bad you got rid of the “wife-beater mustache”, btw.. Your photos are absolutely amazing. I totally imagine you when you are old telling your stories to little kids.